At Virginia Tech, football is a way of life. Saturdays are reserved for tailgating and losing your voice with 66,233 of your closest friends. It’s Blacksburg’s biggest party, or arguably Southwest Virginia’s biggest party, if you ask me. As my last season in Lane comes to a close, I look back on the last four years and find the moments that made me scream and yell in ecstasy. Choosing the five most memorable moments over the last four years was quite a task, but I think I found five that speak the best. My pal, Molly, and I flash our VT hands before the Marshall game! 5. Blocked Punt/TD vs. Marshall, 2013: Just when I feared that classic Beamerball was fading away, senior cornerback Kyle Fuller proved me wrong. When Marshall’s first possession resulted in 4th-and-24, the kicker set up for a punt. But that punt was blocked by Fuller and returned for a touchdown. It might have been a trickle of rain, but for a moment, I thought that play brought a tear to my eye. 4. 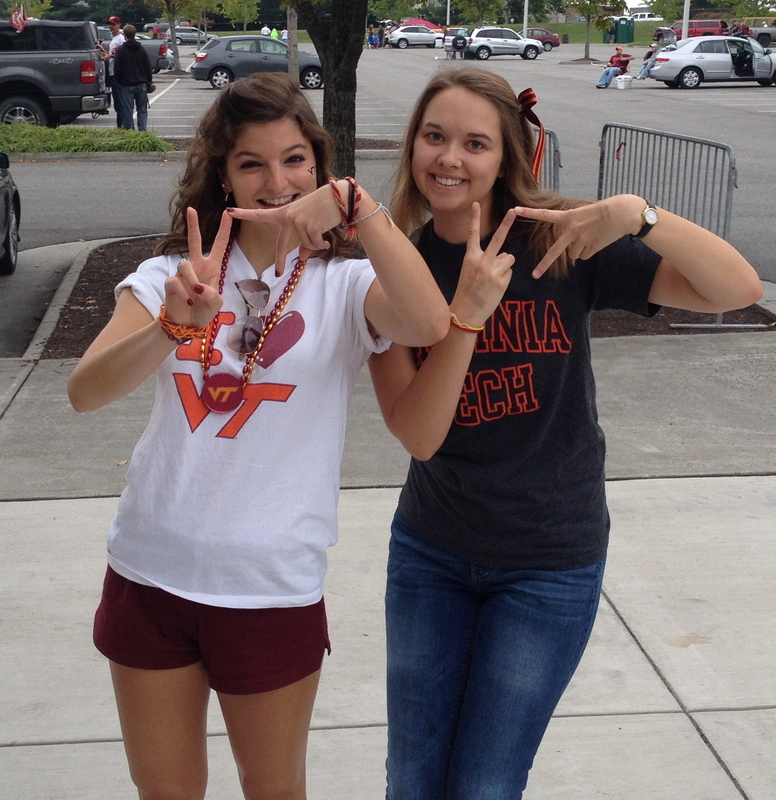 Biggest Comeback in VT History vs. Duke, 2012: It was our Homecoming game my junior year. I’ve always said the Hokies are a slow-starting team, but when we went into halftime down 21-0 to the Blue Devils, I got worried. 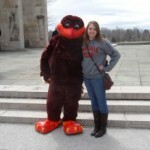 But my Hokies proved my nerves unnecessary and scored 42 unanswered points to claim the Homecoming victory. It was a comeback for the ages, and I’m so glad I got to witness it. The fact that it came against Duke was so much sweeter. I hate Duke. 3. 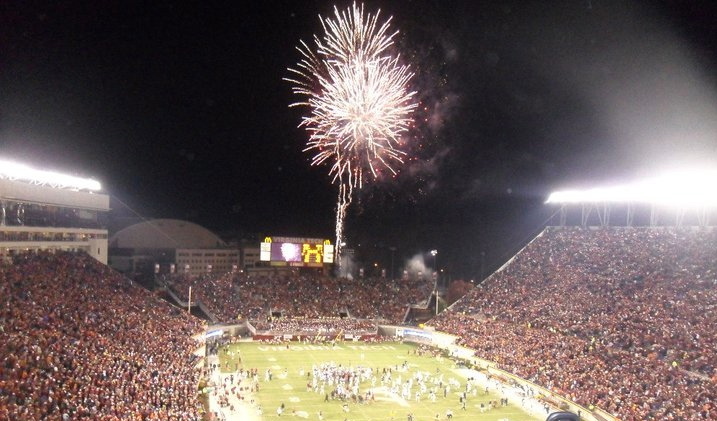 First Overtime Game & Victory vs. Georgia Tech, 2012: The 2012 season opened with a huge ACC matchup against “The Other Tech.” The Hokies and Yellow Jackets exchanged scores throughout regulation. Kicker Cody Journell sent the game to Lane’s first-ever overtime with a 41-yard field goal as time expired. GT failed to score in their first overtime possession, thanks to a beautiful interception by Kyle Fuller on third down. The Hokie offense came back out and set up Journell for the game-winning kick. 17 yards has never made me more nervous. Journell nailed the kick and secured the Hokies’ 20-17 victory. I will forever maintain that in the moment Journell lined up and the ball was hiked, I could have heard a pin drop in Lane. I got chills just writing that. Fireworks go off to celebrate the 28-21 win over Georgia Tech, Nov. 4, 2010. 1. Miami, 2011: Picking just one moment from this game is next to impossible, because the entire game was packed with excitement and lots of Danny Coale catches. But perhaps the greatest moment was “The Run.” Down 35-31 with barely a minute left in the fourth quarter, at 4th-and-1, it was do-or-die time for the Hokies. Quarterback Logan Thomas lined up in the shotgun. I held my breath as the ball was snapped. And then Logan ran the ball 18 yards for the touchdown. Lane erupted. “Enter, Sandman” blasted. As ESPN commentator Mike Patrick said, “These people are losing their minds.” And we totally did. There are countless other moments and games I could write about, inside and outside of Lane Stadium. But perhaps that’s another piece for another day. Right now, I am just cherishing my four years attending games at Lane Stadium, and planning my first trip back next fall as an alumnus. 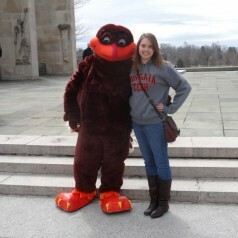 Hokie, Hokie, Hokie Hi! Tech, Tech, VPI! Sola-Rex, Sola-Rah, Polytech Virginia! Rae Ri VPI, Team Team Team!